Gabbi Lancaster is an Australian artist living in Maroubra, Sydney with an art making practice spanning over 25 years. Her work is an expression of her love for nature. In 2016 after learning about the Sydney light rail project and the unnecessary destruction of our environment, she was compelled to spend time with the endangered trees, painting a body of work highlighting their magnificence, beauty and vulnerability. Gabbi developed a strong connection with the ancient Moreton Bay fig trees on Anzac Parade and Randwick. She witnessed the midnight chainsaw massacres and as a consequence her art practice was transformed into an expression of peaceful activism. 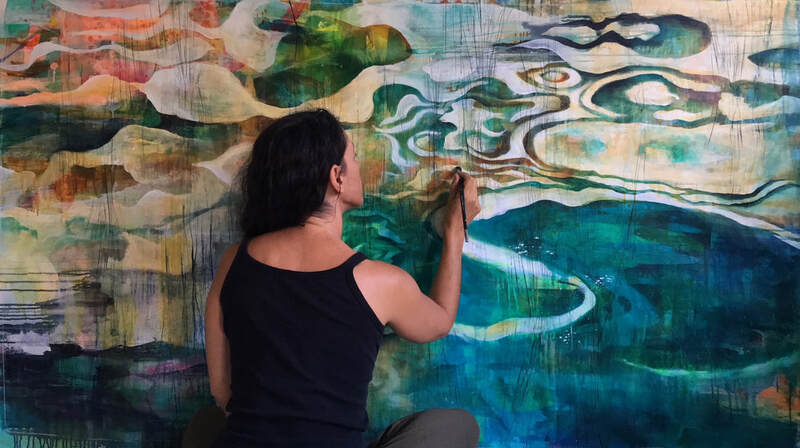 Gabbi exhibits regularly and has had three solo exhibitions: TOPAZ (2018) at Aro Gallery, JADE (2016) – Dedicated to Sydney’s Moreton Bay Fig Trees and ELEMENTAL (2015) – intimate reflections of land and sea and sky, at M2 Gallery. She has exhibited in numerous group exhibitions, she has been a finalist in the Waverley art prize, Little Things art prize and was awarded the Mayors prize at the Trees For Life exhibition, Randwick. Her work is in private collections in Australia, Europe and USA. "During the late 80’s, I studied figurative art and anatomy at The Paddington Art School. I realised that we were learning about much more than drawing and painting. It was an awakening and deepening of perception, sensitivity, a way of being. I experienced moments, while drawing, of being in an altered state, meditative, it was spiritual and I loved that mysterious feeling. I spent thousands of hours drawing and developing. I was privileged to work for a few great teachers and artists collaborating, learning and creating." For over ten years Gabbi has been developing and facilitating art and creativity programs for children, and more recently working with adults. In 2005 she founded the South Coogee Art Club, an after school visual art program for primary school children. Here, children are encouraged to search, imagine, observe and experiment with a variety of art forms. Gabbi has also provided professional support in visual art to primary school teachers and worked with community members on communal mural projects. My latest project is ‘Art in the Garden’ - explorations in paint and creativity with adults.